In this digital age, almost every accounting firm has an attractive website which touts the firm’s expertise and experience in a wide range of services. Accounting firms recognize that an impressive website can be an effective marketing tool to prospective clients, and can also assist current clients in determining additional services which the client may find of interest. However, in the unfortunate event that a legal claim is brought against your accounting firm, you should be aware that the firm website may often serve as Exhibit “A” in support of the claim. In particular, a professional services website often includes marketing words and phrases that are directed at putting the firm in the best light possible to its current and potential clients. Undeniably, this is a goal of the website. Yet, it is also undeniable that professional services websites are known to include “fluff” statements pertaining to the firm’s capabilities and services. While your firm’s marketing agency may extol the marketing benefits of such statements, your firm’s lawyer would likely advise against such statements — for good reason. You cannot anticipate that a jury will be capable of deciphering the differences between a marketing tool and reality. Does your website accurately reflect the services that your firm is capable and qualified to provide to its clients? For example, many accounting firm websites state the fact that the firm provides financial advisement to its clients. Quite simply, unless your firm is truly capable of providing financial advisement to its clients, and in fact does so, your website should not include such a statement. Otherwise, when a client’s investment portfolio takes a hit, you may be sued for the investment decisions your client made without your guidance or input. In this case, your website will almost certainly be used against you. If you are solely a tax accountant, do not include words such as “analysis,” “scrutinize,” or “examine,” with respect to the services you provide to your clients. The preparation of tax returns generally permits an accountant to rely upon the supporting documentation provided by the client. Thus, an accountant would not be analyzing, scrutinizing, or examining the supporting documentation. In the event a client’s investment performs poorly, you do not want to be accused of being responsible for analyzing financial documentation provided by your client when preparing tax returns. Importantly, this point also applies to invoices related to the preparation of tax returns. Keep your website updated. If an accountant’s qualifications or scope of services provided to clients changes, make sure the website reflects the same. If an accountant leaves the firm, make sure to promptly remove the accountant’s biography from the website. An outdated or inaccurate website may unnecessarily lead to trouble in litigation. A “battle of the experts” is often the reality in civil litigation. A case may be won or lost based on expert testimony and this is equally true in the context of federal practice. As a result, keeping a plaintiff’s questionable and over-reaching expert testimony out of the courtroom becomes key. On July 1, 2013, the Florida Legislature adopted Daubert through passage of Florida Statute § 90.702.1 Florida’s adoption of the federal Daubert2 standard profoundly changes the realm of expert testimony, keeping suspect expert testimony from juries. This article discusses the adoption and progression of Daubert within federal courts, specifically successful Daubert challenges within the Eleventh Circuit Court of Appeals. Daubert challenges may now be used within Florida courts, with trial courts being more receptive to persuasive federal authority for the first time. The adoption of Daubert in Florida state courts is certainly an advantage for the defense. A successful Daubert challenge can lead to the exclusion of evidence required by plaintiffs to prove elements of the case, thereby increasing chances of succeeding on summary judgment. Even if summary judgment is not the ultimate outcome, a court may grant motions in limine based on a Daubert hearing. Most importantly, Daubert stressed that the factors delineated in its analysis are “non-exhaustive,”29 which allows for creative lawyering in drafting Daubert motions based on the idiosyncrasies of each discipline and field of expert testimony. Motor Co., Inc., 238 F. App’x 537, 540 (11th Cir. 2007): Product liability suit, where the plaintiff alleged high temperatures inside the footwells of his ATV made the vehicle unreasonably dangerous and caused injury. The olaintiff’s expert in ATV design and safety conducted tests using a dummy with temperature probes on its ankles. The expert concluded the ATV was unreasonably dangerous and could cause burns. The court excluded the testimony under Daubert due to unreliable methodology. The expert “produced no data showing that the conductive and heat-retentive properties of the dummy’s foot were similar to those of a human foot. Nor did he show a reliable way to extrapolate from the temperature readings on the dummy’s foot to the comparable temperatures on a human foot.” Th court also highlighted that varying testing conditions used by the expert also jeopardized reliability. Summary judgment affirmed due to the plaintiff’s inability to prove a safer, alternative design. McDowell v. Brown, 392 F.3d 1283, 1300 (11th Cir. 2004): Expert claimed delay in treatment of a spinal epidural abscess caused or worsened the plaintiff’s condition. He based his opinion on common sense that earlier treatment is preferable to later intervention. He also used a study that analyzed the effects of 48 hours of delay in treatment; however, the court concluded the study should not be applied to the 24 hour delay in that case. The expert’s theory should not “leap” from an accepted scientific premise to an unsupported one. The Eleventh Circuit’s willingness to consider Daubert challenges in many different disciplines of law is certainly an advantage for future state court challenges. In order to seize such an advantage, it is important for counsel to proactively set-up a Daubert challenge and plan for one prior to taking expert depositions. 1 Fl. State Stat. § 90.702 (2013). 3 See, Frye v. United States, 293 F. 1013, 1014 (D.C. Cir. 1923). 7 See, Daubert, 509 U.S. at 585. 13 Id. at 579, 589. 16 Id. at 593-94. Note, the Daubert standard is codified in Federal Rule of Evidence 702. 21 526 U.S. 137, 138 (1999). 25 See, Daubert, 509 U.S.at 580 (“The [Daubert] inquiry is a flexible one. . . .”). 26 American Trial Lawyers of America, Living with Daubert- Learn the Science and Leave the Checklists Behind, 2 Ann.2002 ATLA-CLE 2595 (2002). 27 A. Leah Vickers, Daubert, Critique and Interpretation: What Empirical Studies Tell Us About the Application of Daubert, 40 U.S.F. L. Rev. 109, 110 (2005). 28 Edward K. Cheng & Albert H. Yoon, Does Frye or Daubert Matter? A Study of Scientific Admissibility Standards, 91 Va. L. Rev. 471, 472-73 (2005). 29 See, Kumho, 526 U.S. at 158 (““Daubert was intended neither to be exhaustive nor to apply in every case.”). 30 This is a great case for medical malpractice based Daubert challenges. This holding gives great importance to a differential diagnoses. 31 This case sets the standard for use of medical literature with less emphasis or importance of someone agreeing to whether it is “authoritative.” Daubert makes use of medical literature essential. Maritime law, also referred to as admiralty law, is the body of law that governs navigation and shipping. It is a unique area of law that differs from common law and is applied uniformly throughout the country. Maritime law provides a legal framework for issues and accidents that take place on domestic, territorial and international waters. In light of the complexity of maritime laws, the number of law firms and attorneys with the requisite experience and knowledge of maritime law issues is limited. Therefore, as the number of maritime accidents involving personal watercraft and boats continues to rise, the necessity of understanding the rights and remedies available under maritime law for vessel owners has become more important than ever. 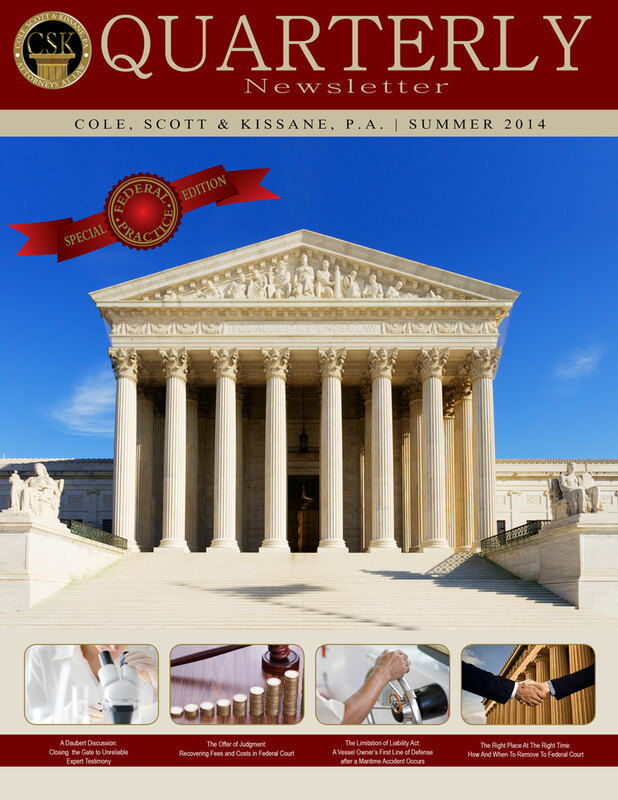 CSK has been at the forefront of this ever-developing field of law. In addition to specifying the location of the underlying incident, the Complaint must also set out the date and place of the termination of the voyage on which the casualty occurred, and state with particularly all known outstanding claims related to the voyage and their type.12 The Complaint must also state with particularity the post loss value of the vessel and pending freight, if any, where the vessel currently is located and in whose possession the vessel may be found. Once the stay and monition period have been ordered, the vessel owner must provide notice of the stay and monition to all potential claimants.17 Notification is accomplished by publishing the stay and monition order in a newspaper of general circulation in the area where the action was filed.18 The notice must appear in the publication once a week for four (4) consecutive weeks prior to the date fixed for the filing of the claims in the limitation proceedings.19 Further, the notice must be mailed to each person known to have made a claim against the vessel or owner arising from the subject voyage no later than the day of second publication. Overall, despite the procedural complexity of bringing a Limitation action, the opportunity of limiting a vessel owner’s liability to the value of their vessel can serve as a powerful defense to claims stemming from personal injury or death. CSK’s unique and extensive experience in this highly specialized field of law enables us to provide clients with the requisite insights and competent representation throughout all phases of such litigation. 2 Lake Tankers Corp. v. Henn, 354 U.S. 147 (1957). 5 3 BENEDICT ON ADMIRALTY, supra note 42, § 11, at 2-5. 7 Fed.R.Civ.P.Supp. F(9), Supp. Adm. R.
8 Rodriguez Morira v. Lemay, 659 F. Supp. 89 (S.D.Fla. 1987). 10 In re M/V Sunshine, II, 808 F.2d 762 (11th Cir. 1987). 15 Pickle v. Char Lee Seafood, Inc., 174 F.3d 444 (4th Cir. 1999). 16 46 U.S.C. §30505, Fed.R.Civ.P.Supp. F(3) and F(4); In re Dammers & Vanderheide & Scheepvaart Maats Christina B.V., 836 F.2d 750, 755 (2d Cir. 1988); Universal Towing Co. v. Barrale, 595 F.2d 414, 417 (8th Cir. 1979). 22 Carr v. PMS Fishing Corp., 191 F. 3d 1, 4 (1st Cir. 1999). 23 Keys Jet Ski, Inc. v. Kays, 893 F.2d 1225, 1230 (11th Cir. 1990) (citing Farrell Lines Inc., Jones, 530 F.2d 7, 10 (5th Cir. 1976). 24 In re Marine Sulphur Queen, 460 F.2d 89, 104 (2d Cir. 1972). 25 In re Complaint of Messina, 574 F.3d 119, 126-27 (2d Cir. 2009). Often times, a defendant is sued in state court and presented with the option to remove the matter to federal court. Differences between federal and state procedural rules, as well as judicial efficiency factors that may allow for timely and early resolution of a matter, are typically primary considerations in making the determination whether to remove. If a case warrants removal, it is axiomatic that a party seeking to remove must strictly comply with the statutory procedure for removal. Winters Gov’t Securities v. NAFI Employees Credit Union, 449 F. Supp. 239, 241 (S.D. Fla. 1978). Federal statutes in general require strict compliance. In the context of removal, however, compliance is case specific and time sensitive, with numerous ins and outs, warranting careful analysis and clear understanding. § 1446(b) (emphasis added). The time-window “is triggered by simultaneous service of the summons and complaint, or receipt of the complaint, ‘through service or otherwise,’ after and apart from service of the summons, but not by mere receipt of the complaint unattended by any formal service.” Murphy Brothers, Inc. v. Michetti Pipe Stringing, Inc., 526 U.S. 344, 347-48 (1999); See also Romero v. Randle Eastern Ambulance Service, Inc., No. 08-23179-CIV, 2009 WL 347412 (S.D. Fla. 2009) (defendant’s receipt of an e-mail attaching a non-conformed copy of the complaint does not trigger the thirty day period under § 1446(b)); Sims v. Aropi, Inc., 8 F. Supp. 2d 1367, 1369 (S.D. Fla. 1997) (holding defendant’s receipt of non-conformed copy of complaint, which contained neither a court file stamp nor a civil action number, did not commence 30-day removal period). As the Supreme Court in Murphy Brothers aptly put, “[a]n individual or entity named as a defendant is not obliged to engage in litigation unless notified of the action, and brought under a court’s authority, by formal process.” Id. at 348. Thus, a defendant is required to act, and is bound by the thirty day time-window, “only upon service of a summons or other authority – asserting measure stating the time within which the party served must appear and defend.” Id. at 345. The statutory language of § 1446(b) though only contemplates one defendant and does not account for actions where multiple defendants are present and receipt by each defendant, “through service or otherwise,” of a copy of the initial pleading is not simultaneous. See Bailey v. Janssen Pharmaceutica, Inc., et al., 536 F. 3d 1202, 1205 (11th Cir. 2008) (citing Brierly v. Alusuisse Flexible Packaging, Inc., 184 F. 3d 527 (6th Cir. 1999)). This is an important distinction, as unanimity among defendants is required for removal. See Russell Corp. v. Am. Home Assur. Co., 264 F. 3d 1040, 1050 (11th Cir. 2001) (the unanimity rule requires that all defendants consent to and join a notice of removal in order for it to be effective). Indeed, a question arises as to how to calculate the timing for removal in the event multiple defendants are served at different times – especially if one or more of them is served outside the original 30-day period. Bailey, 536 F. 3d at 1205. The Eleventh Circuit recognizes in this instance the last-served defendant rule, meaning each defendant is permitted thirty days in which to seek removal. Id. In so doing, the Eleventh Circuit rejects what other courts recognize as the “first-served rule”, which in application, the thirty day time-window for removal is triggered as of the date of service on the first defendant. See, e.g., Getty Oil Corp. v. Ins. Co. of N. Am., 841 F. 2d 1254, 1262-63 (5th Cir. 1988). As a result, a defendant who otherwise waived the right to seek removal through its own non-adherence with § 1446(b) may have a second opportunity to remove a matter to federal court at such time that a last-served defendant elects to do the same, through joinder. See Bailey, 536 F. 3d at 1205; Russell Corp., 264 F. 3d at 1050 (requiring unanimity). With regard to the actual document(s) by way of which the time-window for removal may be triggered, “a case may be removed on the face of the complaint if the plaintiff has alleged facts sufficient to establish the jurisdictional requirements.” Lowery v. Ala. Power Co., 483 F. 3d 1184, 1215 n. 63 (11th Cir. 2007). With diversity jurisdiction, actual knowledge by a defendant is not required and mere notice in the complaint of the potential that plaintiff’s claims meet the requirements of diversity, as alleged, is sufficient. As courts in Florida have stated: “[adding an actual knowledge limitation would complicate an otherwise straightforward statutory provision [(§ 1446(b)], adding a cloud of uncertainty over removal actions, and requiring courts to engage in the difficult and uncertain task of determining whether a particular communication could have (or should have) provided adequate notice to a defendant of a plaintiff’s claimed damages.” Ragbir, 2009 WL 2423105 at 5 (quoting Callahan v. Countrywide Home Loans, Inc., No. 3:06-cv-105, 2006 WL 1776747, at 4 (N.D. Fla. June 26, 2006)). Therefore, it is a bright-line rule that actual knowledge by a defendant is not required so as to “promote certainty and judicial efficiency by not requiring courts to inquire into what a particular defendant may or may not subjectively know.” Id. (quoting Chapman v. Powermatic, Inc., 969 F. 2d 160, 163 (5th Cir. 1992)). Of course, instances where a federal court would have had original jurisdiction over the action may not necessarily exist at the time of and/or in an initial pleading, or complaint. If an amended complaint by happenstance is the first document by way of which a defendant may first ascertain that federal jurisdiction exists, the thirty-day time-window under § 1446(b) would be triggered then. See Lowery, 483 F. 3d at 1215 n. 63 (thirty-day time limit does not begin to run until a defendant receives an unambiguous statement from the plaintiff which clearly establishes federal jurisdiction). When not readily ascertainable from the complaint, this statement may come from any “other paper” from the plaintiff, including deposition testimony, subsequently obtained. Id. at 1212 n. 62. Evidence independently gathered by the defendant “from outside sources … is not of the sort contemplated by § 1446(b).” Id. at 1221. A problem may arise though if the “other paper” arguably is in the form of a pre-suit document. A pre-suit document may or may not trigger the time-window; it is again a matter of circumstance and case specific. See Village Square Condominium of Orlando, Inc. v. Nationwide Mutual Fire Ins. Co., No. 6:09-cv-1711-Orl-31DAB, 2009 WL 4855700, at 2 (M.D. 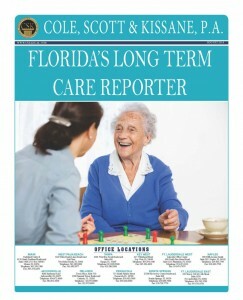 Fla. Dec. 10, 2009). With diversity jurisdiction, the elemental status of citizenship of the parties is not necessarily something that is in dispute and is something that may not be divested by subsequent events. See Village Square Condominium, 2009 WL 4855700 at 2. As a result, pre-suit documents that notify a defendant of complete diversity of the parties as to citizenship can – together with a later filing of an initial pleading that otherwise puts a defendant on notice of satisfaction of all other requirements for diversity jurisdiction – trigger the thirty day time-window for removal. See Id. (internal citations omitted). To the extent citizenship is not clearly set forth in an initial pleading and the only notice of such is in a pre-suit document, the time window for removal still commences at the time of initial filing and/or ascertainment by a defendant of an opportunity to remove – separate and apart therefrom. Id. Courts do not view citizenship in an “other paper” as an exception, tolling time. On the other hand, pre-suit documents that pertain solely to the amount in controversy requirement for diversity jurisdiction do not necessarily work the same way. If a defendant is put on notice pre-suit of damages exceeding the amount in controversy requirement for diversity jurisdiction, there exists no certainty that the amount of damages claimed will remain the same through the time of filing of a formal lawsuit. Id. So, if the amount in controversy is not specifically alleged in the initial pleading, “defendants often must rely on demand letters, medical bills, affidavits from experts and carefully worded (if not deliberately evasive) responses to discovery requests – each of which may have a bearing on a plaintiff’s damages only a particular point in time.” Id. Until such information is obtained and/or confirmed, a defendant cannot ascertain or, through an initial pleading, learn that a federal court would have original jurisdiction over the action and cannot remove. See Grupo Dataflux, 541 U.S. at 592. “By its plain terms the statute requires that if an ‘other paper’ is to trigger the thirty-day time period of the second paragraph of § 1446(b), the defendant must receive the ‘other paper’ only after [the defendant] receives the initial pleading.” Armstrong v. Sears, Roebuck and Co., No. 8:09-cv-2297-T-23-TGW, 2009 WL 4015563, at 1 (M.D. Fla. Nov. 19, 2009) (quoting Chapman, 969 F. 2d at 164). In sum, in order for a defendant to meet his or her burden of showing removal as appropriate in a matter, a defendant must meet the requirements for diversity jurisdiction at the time of removal. See Village Square Condominium, 2009 WL 4855700 at 2 (citing, e.g., Lowery, 483 F. 3d at 1208; Gaitor, 287 F. 2d at 255). That said, even if a matter is ripe for removal, removal to federal court is not always a prudent strategy. Clients should confer with counsel to discuss the potential benefits and consequences of litigating in federal court, some of which are described in other articles in this Quarterly. 1 Diversity jurisdiction requires that all plaintiffs be diverse from all defendants and that the amount in controversy exceed $75,000. 28 U.S.C. § 1332(a)-(b) (2006). Brian Dominguez, an Associate from CSK’s Miami office, sat down recently with one of our firm’s distinguished Partners, Thomas Scott, to talk about the practical challenges of litigating in federal court. His perspective is unique. Mr. Scott was appointed and formerly served as a United States Florida State Circuit Court Judge and District Court Judge for the Southern District of Florida from 1985 to 1990. After leaving the bench, Mr. Scott earned the honor of serving as United States Attorney, again for the Southern District, from 1997-2000. His years of experience and profound passion for jurisprudence serve as an asset to our firm and particularly to our younger lawyers as part of CSK’s commitment to quality training and mentorship. Mr. Scott and Mr. Dominguez focused their discussion on the upcoming challenges our clients will face in federal proceedings and how these challenges will affect the way that claims should be handled. Brian: Good morning, Judge Scott. Thanks for taking time to meet today. Tom: Always a pleasure, Brian. Brian: Let me begin with a simple question. What advice do you have for claims handlers who are adjusting matters in federal litigation? Tom: First and foremost, the most important advice I would give claims handlers is to obtain a lawyer that has experience litigating cases in federal court. Second, I think claims handlers should be aware that cases tend to move much more quickly in federal court than they do at the state level. Finally, claims handlers should be aware that matters in federal court will typically require more time spent by the attorneys handling the case in researching and drafting legal memoranda, as many of the motions filed in federal court will require memoranda of law. Brian: And what would you say is the most common pitfall for claims handlers who are overseeing matters in federal court? Tom: I think you raise a very important question. The most common pitfall I see is the assumption that the case will move along in the same manner as a case in state court. Typically, cases in federal court will move along much more quickly. The assumption that a case filed in federal court will proceed at the same pace as a case filed in state court can lead to a claims handler and the attorney retained to defend the case getting into trouble by making a crucial mistake early in the case. These mistakes are usually compounded by the fact that extensions of time are typically more difficult to obtain in federal court. Brian: I’m sure clients sometimes have misconceptions about the risks and benefits of federal proceedings. Tell me, what do you think is the biggest misconception about matters pending in federal court versus matters pending in Florida state court? Tom: Well Brian, I think the biggest misconception is that cases in federal court will last longer than cases filed in state court. Although cases filed in federal court can potentially move along slowly to start, once a scheduling order is entered by the judge, the cases will typically move along very quickly, with fast approaching deadlines. These fast approaching deadlines will usually lead to a case being completed in 12 to16 months. Brian: I’m sure there are advantages and disadvantages as well. Tom: Of course. The biggest advantage is that generally the case will be handled by a judge with more time and resources to devote to the case. This is usually a result of the lighter case load for most federal judges compared to state court judges. In addition, federal judges typically have two law clerks that can help the judge apportion more time to a given case or issue. This situation usually leads to more thorough consideration being given to major case decisions. Finally, the same is usually true of appellate review in federal court. Brian: And how about some of the disadvantages? Tom: The key disadvantage is typically the speed with which the case will move forward. Again, once a scheduling order is entered, both the claims handler and the attorney will need to be ready and available to spend a considerable amount of time on the case. It has been my experience that if time and consideration is not given early on to the needs of a particular case, the involved parties may need to work to slow down the federal court’s fast moving schedule. This is typically easier early on in a case. It is much more difficult to have a federal judge make changes to a schedule once a significant amount of time and energy has been spent on a given case and a major deadline is fast approaching. Brian: Let’s talk for a moment about new challenges. What new discovery challenges will carriers face in federal cases in 2014? Tom: Great question, Brian. As you know, on December 1, 2013 amendments to Federal Rule of Civil Procedure 45 took effect. These changes were designed to clarify and simplify the rules with respect to the issuance and compliance with subpoenas. Notably, subpoenas may now be served nationwide. Previously, courts were limited to a particular geographic area in serving and enforcing subpoenas. In addition, the amendments also require and clarify that prior notice, along with a copy of the subpoena, must be served prior to issuance of the subpoena. Also relevant, although not yet in effect, several changes have been proposed to the Federal Rules of Civil Procedure. Specifically, changes have been proposed to Rules 1, 4, 6, 16, 26, 30, 31, 33, 34, 36, 37, 55, and 84. These proposed changes claim to modernize and streamline the federal rules in order to expedite litigation. As part of these changes, the proposed rules expedite the early stages of federal litigation, create more cooperation, and lead to more efficient discovery. For example, some of the proposed changes involve a reduction in time to serve complaints, a reduction in time for judges to issue scheduling orders, presumed limits on the number of depositions and discovery requests, and changes to Rule 37 on the availability of sanctions for the failure to preserve electronically stored information. Brian: And what impact will these new challenges have? Tom: The biggest impact that the amendments will have is that they will simplify the process for issuing subpoenas. Relevantly, however, carriers should pay special attention to the additional proposed changes to the Federal Rules of Civil Procedure, as many of these changes will have a drastic impact on discovery in federal court and the speed with which cases move through the system. Brian: What advice would you give to carriers in choosing counsel to handle matters in federal court? Tom: Well, the most important consideration is obtaining counsel that has a considerable amount of experience in federal court. This experience with the federal system will serve both the claims handler and the client well because the attorney will be able to ensure that the case moves forward at an appropriate speed and that ample time is devoted to complying the court deadlines and requirements. Experienced federal practitioners will also be familiar with the various district and magistrate judges. This knowledge will prove invaluable to claims handlers who will typically be able to receive better instruction for what is happening and what will happen in a given case. Brian: By the same token, what would you say are the dangers of obtaining counsel inexperienced with federal matters? Tom: Where to begin? I think it’s fair to say that obtaining counsel with little or no experience in federal matters can create a wide variety of dangers and pitfalls for both claims handlers and insureds. First, counsel inexperienced with federal matters will typically be surprised by the speed at which the case will eventually move. This can lead to mistakes being made either because a deadline is missed or work product is turned around in a short amount of time that has not been give the time and consideration necessary. Second, inexperienced counsel will have a more difficult time explaining to the claims handler and insured what should be expected. Whereas an experienced federal practitioner will be in a position to better evaluate a case and provide a more realistic evaluation, an attorney with little or no experience in a federal court will have a difficult time explaining what a judge is likely to do or how a particular argument or strategy will be received by the federal courts. Brian: Just one more question before we wrap this up. Why is CSK uniquely equipped to handle federal matters? Tom: Well Brian, I think it’s fair to say that we are uniquely equipped because CSK employs a large number of attorneys who are not only extremely bright and effective advocates, but who also have a wealth of experience in federal court. This federal experience, as I’ve mentioned, will serve both the claims handler and the insureds well in being able to receive a greater understanding for the federal court process and the thought processes of its very qualified judges. The rigors and pace of federal litigation can drive-up the costs of defense. A prudent litigator should seek ways to recover fees and costs, where possible, for the benefit of his or her client. One means of recovering fees and costs in your federal case is pursuant to a proposal for settlement, also referred to as an offer of judgment. Two mechanisms, Fla. Stat. § 768.79 and Federal Rule of Civil Procedure 68, are available for shifting fees pursuant to a proposal for settlement in federal courts that are located within the State of Florida. While similar in some ways, these two sources of law also differ in a number of key respects. To ensure the validity and enforceability of proposals for settlement in federal court, one must carefully consider a number of factors. These factors include the nature of the jurisdiction being exercised by the court, whether the suit stems from a federal question or alleged violation of a Florida statute and whether the underlying statute specifically provides for recovery of attorneys’ fees. The terms “offer of judgment” and “proposal for settlement” are often used interchangeably. in a number of key respects. acAt the outset, it is critical to note that fees can only be recouped in federal court pursuant to § 768.79 in cases where the court is exercising diversity or supplemental jurisdiction and is applying Florida substantive law.2 In a diversity action, the court looks to the substantive law which creates the cause of action. Federal Rule of Civil Procedure 68 provides a federal mechanism for tendering an offer of judgment. This is the procedure that is to be utilized when one is defending an action in federal court which is based on a federal question. While Florida’s proposal for settlement law is modeled after Rule 68 of the Federal Rules of Civil Procedure, the two rules differ in significant respects. Generally, Rule 68 allows a defendant to serve an offer of judgment for a specified amount, which includes the costs accrued to date. If the plaintiff accepts the proposal in writing within 14 days of service, the clerk must then enter judgment against the defendant in the agreed upon amount. If the plaintiff rejects the offer and the result obtained is less than the amount of the rejected offer, the plaintiff must reimburse all costs incurred after the offer was made. Rule 68 typically only shifts the costs, not attorneys’ fees, incurred during the litigation to the plaintiff if he or she fails to accept a proper offer of judgment. Indeed, the sole constraint Rule 68 places on offers of judgment is its mandate that an offer include “costs then accrued.”24 Thus, as long as an offer does not explicitly exclude costs, it is proper under the Rule.25 When a Rule 68 offer is silent regarding the amount of costs, the court must award an appropriate amount for costs in addition to the specified sum. The authority to determine and award costs arises from the phrase “with costs then accrued” in Rule 68.26 That said, under certain circumstances, Rule 68 can shift attorneys’ fees, as well as costs, to the plaintiff. In Marek v. Chesny, the Supreme Court held that the term “costs” in Rule 68 “was intended to refer to all costs properly awardable under the relevant substantive statute or other authority.”27 When the underlying statute defines “costs” to include attorney’s fees, such fees can be recovered pursuant to a Rule 68 offer of judgment.28 Although attorneys’ fees are generally not recoverable as costs under what is known as the “American Rule,” the Supreme Court held that where the relevant authority defined attorneys’ fees as part of the “costs,” fees were subject to the cost-shifting provision of Rule 68.29 In order to recoup fees under Rule 68, it is critical that the underlying statute unequivocally provides for fees to be paid to the prevailing party. For example, Marek involved the recovery of attorneys’ fees under section 407 of the Communications Act of 1934, which stated that “if the petitioner shall finally prevail, he shall be allowed a reasonable attorney’s fee, to be taxed and collected as a part of the costs of the suit.” Conversely, attorneys’ fees are not categorized as costs where the underlying statute merely speaks of “costs” in the context of damages. The requirement of clear statutory language supporting an award of fees was succinctly set forth in Oates v. Oates30. There, the court stated that “in the absence of unambiguous statutory language defining attorney’s fees as an additional component of costs, and a clear expression by Congress of an intent to carve out an exception to the American Rule…attorney’s fees are not ‘costs’ for purposes of Rule 68.” 31 Lastly, a contractual provision entitling a defendant to fees can also serve as a basis for fee recovery pursuant to a Rule 68 offer of judgment. The Marek court noted that the Supreme Court determined that the term “costs” in Rule 68 “was intended to refer to all costs properly awardable under the relevant substantive statute or other authority.”32 The court in Utility Automation 2000 v. Choctawhatchee Elec.33 found that, for Rule 68 purposes, this reference to “other authority” encompassed contractual provisions awarding fees. Again, the relevant contractual provisions must unequivocally award fees to the prevailing party and not be subject to varying interpretations. 34 When litigating in federal court, a prudent defense strategy should, from the outset, consider fee-shifting mechanisms as a means of leveraging a prompt and favorable resolution. The above-referenced authorities are among the most valuable tools that can be employed by defense counsel for such purposes. Endnotes 1 Eagleman v. Eagleman, 673 So.2d 946, 947 (Fla. 4th DCA 1996) 2 Design Pallets v. Gray Robinson, P.A., 583 F. Supp. 2d 1282 (M.D. Fla. 2008) 3 James v. Wash Depot Holdings, Inc., 489 F.Supp.2d 1336 (S.D.Fla. 2007) 4 583 F. Supp. 2d 1282 (M.D. Fla. 2008) 5 Id. at 1285 6 Id. at 1287 7 Id. at 1287 8 Menchise v. Akerman Senterfitt, 532 F.3d 1146 (11th Cir. 2008) 9 Horowitch v. Diamond Aircraft Indus., Inc., 645 F.3d 1254, 1258 (11th Cir. 2011) 10 432 F.Supp.2d 1283 (M.D. Fla. 2006) 11 Id. 12 Id. 13 Id. 14 Id. 15 Id. 16 Id. 17 Vines v. Mathis, 867 So.2d 548, 549 (Fla. 1st DCA 2004) 18 Evans v. Piotraczk, 724 So.2d 1210 (Fla. 5th DCA 1998) 19 Id. 20 944 F.Supp. 874, 875 (M.D.Fla.1995) 21 Id. 22 Id. 23 Id. 24 Marek v. Chesny, 473 U.S. 1 (1985) 25 Id. 26 Arencibia v. Miami Shoes, 113 F. 3d 1212, 1214 (11th Cir. 1997) 27 Marek at 9 28 Id. 29 Id. 30 866 F.2d 203 (6th Cir.1989) 31 Id. 32 Marek at 9 (emphasis added). 33 298 F.3d 1238 (11th Cir. 2002) 34 Id.